Just about anyone who’s experienced the stately Ambiance Intrigue fireplace will tell you that it’s something you truly have to see to believe. Considering how it was created, that’s no surprise. What refinements would you incorporate into the ultimate fireplace if you were designing it? 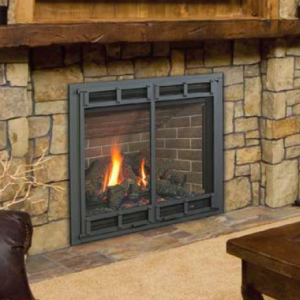 If this fireplace were going into YOUR home, what would you have us do differently? The result was a fireplace that not only heats a room, but one that does so unmatched eye-appeal. It starts with stable gas heat sending flames up through a 12-piece, hand-painted log set that balances the flame and fills the firebox with the most realistic fire in the gas fireplace industry. To further enhance the mellowing experience of a real wood fire, Ambiance created the StepFyre burner, which puts glowing embers below the fire, exactly where they would fall from burning logs. Everything going on inside the firebox is easily seen from the outside with a huge glass viewing area of 910 square inches, making it the biggest in its class. Until now, fireplace buyers have sometimes run into restrictions when trying to find a fireplace with the exact “look” they want. With the Ambiance Intrigue, that will never be a problem. 19 different finish colors ranging from light shades such as Bone Taupe and Champagne all the way up to the darkest Textured Black and Aspire Rust – and everything in between. In all, a homeowner is looking at 135 unique combinations to create a fireplace that’s a one-of-a-kind original and will beautifully accent the décor of any room. A gas fire, when well-engineered, can look great. When you discover the Intrigue’s fire, you will find no equal in the industry! The embers are glowing nearly 2 inches below the log set. It reproduces the real wood fire to a degree never achieved before with a gas fire. Although it is boasting almost 40,000 BTU, the flame pattern is one matching of much greater BTU fireplaces on the market. It provides an incredible enjoyment of the fire for a much longer period of time than other fireplaces. The Intrigue gives you the control over choosing radiant or convection heat. Being one of the most efficient fireplace on the market, whether you operate it with or without the fan, it will warm your heart and your home. Ambiance Intrigue fireplaces can be operated with a handy, intuitive IPI remote control. Use it to select from six flame settings to configure the heat in the room and avoid burning excess gas. The fire can be started remotely through a direct spark or standing pilot. Other important features include a stand-by battery that allows the fireplace to continue running during power outages and an over-50-percent turn-down ratio that brings maximum savings on fuel and increased comfort. Add to all this special accent lights adjusted remotely to six different settings, ultra-quiet remote-controlled fans and the nice finishing touch of a night light that operates independently from the fireplace. It’s not hard to understand why homeowners who enjoy the Ambiance Intrigue in their homes consider it unreservedly the best gas fireplace in its class. Burn Rate Range: 18,500-39,500 BTUs/hr.